The Southern Ground Hornbill is one of South Africa’s endangered bird species. Its conservation status is ‘threatened – vulnerable’. Yesterday this beautiful specimen of the largest species of Hornbill was foraging together with its mate on Thanda Safari. A very exciting sighting for all the Thanda Safari bird lovers. If you enjoy birds have a look at Thanda Safari’s Online Birds Gallery. 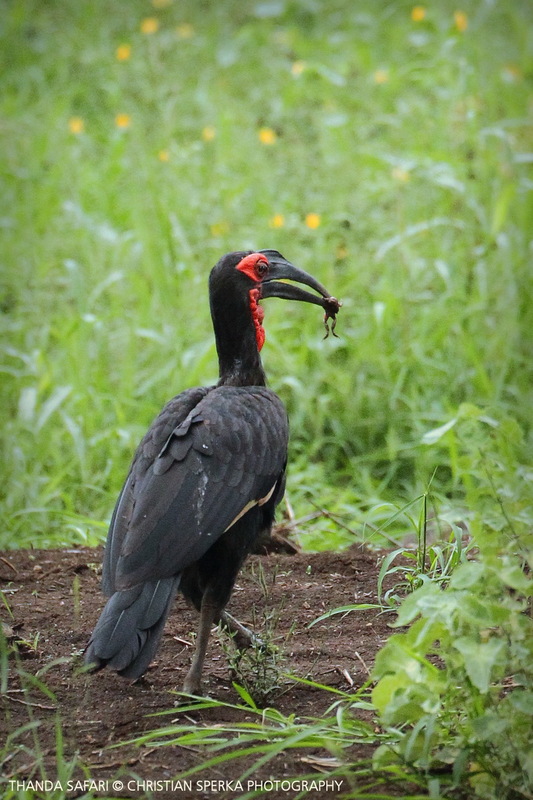 The Southern Ground Hornbill (Bucorvus leadbeateri) is a large bird, at 90 to 129 centimeters (35.4 to 50.8 in) long. Owing to large scale clearing of the bird’s specialized habitat for agriculture, along with its exceedingly slow reproductive rate, it is now classed as vulnerable to extinction. Its loud voice and large size have made it a focal point in many traditional African cultures. Historically, there were strong taboos against killing of Ground Hornbills. For southern African cultures, it was a symbol of the arrival of the rainy season and this may have been a factor in above-mentioned hunting taboos. ← Family Life – Hyena Style!